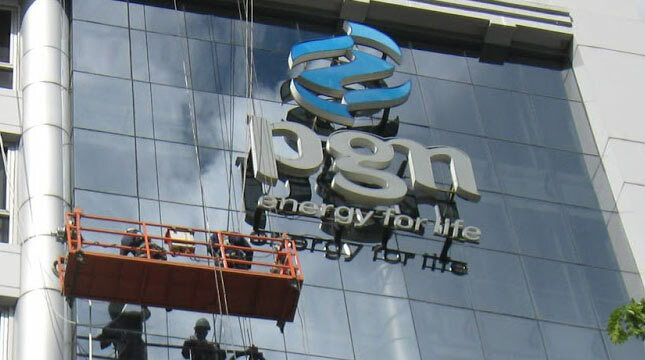 INDUSTRY.co.id - Jakarta - PT Perusahaan Gas Negara Tbk (PGN) is moving quickly by directly repairing the gas pipeline, which was leaked, on Jalan Raya Bekasi, East Cakung, East Jakarta, on Monday afternoon (23/4/2018). Corporate Secretary of PGN Rachmat Hutama in the release said that after obtaining leakage information of the gas pipeline, which is suspected as a result of the toll road project on Jalan Raya Bekasi, Cakung Timur, on Monday afternoon at 15.00 WIB, PGN's DG Handling Team directly runs the security procedures according to emergency response procedures. "The first step is to temporarily halt the flow of natural gas to customers affected by the leak," he said. Then, he continued, coordinating with related institutions such as Muspika, Police, Fire Department, hospitals and surrounding communities is also done quickly, so PGN is able to perform sterilization with a radius of 100 meters from the point of leakage, including turning off all heat sources such as vehicle engines and heavy equipment . The next step taken by TPG PGN, according to Rachmat, is to establish barricade as well as repair faucet which has been completed Tuesday at 02.10 WIB. Efforts to close the hole are done nonstop with the target of public transportation and private cars can go through Jalan Raya Bekasi at 04:45 pm. "Earlier Tuesday, the PGN team re-entered to connect the 'sheet pile' gas pipeline.The toll road contractor will help lift the 'sheet pile' and conduct an 'open cut' excavation along the 'crossing' pipe," Rachmat said. The connection of the gas pipeline is scheduled for completion on Tuesday afternoon and then continued by welding the pipes at night until Wednesday (25/4/2018) morning.